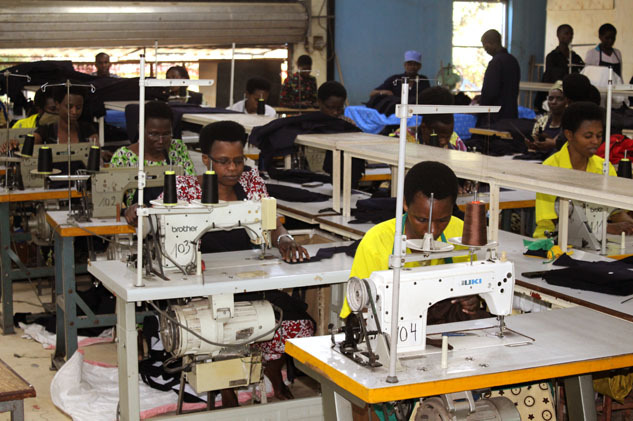 Rwanda Environment Management Authority (REMA) has ordered Usine Textile du Rwanda (UTEXRWA) – a textile industry to relocate in a gazetted wetland urgently. Starting January 28, Rwanda Environmental Management Authority (REMA) gave one-week to businesses operating in wetlands to relocate. Utexrwa currently operates from Kinyinya Sector, Gasabo district its home since 1985 when it was licensed. “UTEXRWA is located in the wetland and should relocate within the one week period. We shall soon go back to see how far Utexrwa and others affected by the decision have gone to implement the decision,” Eng. Coletha Ruhamya, Director General of REMA said on KT Radio’s ‘Ubyumvute’ program on Monday. “There is no excuse. Enough grace period has been given out. All activities in wetlands must relocate, including government infrastructure,” Eng. Ruhamya said. The Factory is positioned on nine acres of land with built-up construction of over 25,000 square meters. It is famous for producing uniforms for students and other institutions, but not for retail consumption. The move is part of an ongoing exercise by the government of Rwanda to close all businesses and structures in areas gazetted as wetlands. The relocation exercise aims at protecting the environment and protecting people from floods among others. When contacted Ritesh Patel, Finance Manager at Utexrwa, told KT Press he is not aware of the order to relocate. “I have been away from Kigali for two months. I have no information about the company being ordered to leave its original location,” Ritesh said. Among other companies that will be affected by this relocation decision is China Road, a construction company based in Kacyiru, Gasabo district. Others are. Kamanyira Leonard – a Parking lot from Kamutwa cell, Kacyiru sector in Gasabo district. Ruhanga football pitch, a bar owned by Bayingana Alexis in Rusororo sector, among others, will also be affected. Public institutions having their activities in wetlands are not exempted in this campaign. Giving some examples, Ruhamya said that a number of infrastructures from Rwanda Energy Group (REG) and Water and Sanitation Corporation (Wasac) would be affected. “These will serve as an example. They know that they have illegal activities in wetlands and some have started relocating. We are not selective,” Eng. Ruhamya said. Relocation decision comes after REMA survey indicated that over 7000 illegal activities are operating from wetlands in Kigali city. Paul Cyamatale one of the KT Radio listeners said; “How can the government tell people to relocate yet they have legal documents, they should be paid before they leave wetlands”. In response, Eng. Ruhamya said; “People living in wetlands will not be relocated forcefully relocated until the government gets them where to live, most of them are poor, but the government will find possible ways to relocate them”. “People with legal documents will be compensated, but those who encroached on wetlands will be relocated without any compensation,”Eng. Ruhamya said. A recent report indicates that 78.9% of 7,222 activities in wetland are illegal. Of these illegal activities, 9.44% are residential housing while 3.18% are both commercial and residential activities. Livestock activities represent 2.85%. The survey indicated that approximately 55% of the activities don’t have any legal documents that authorize them to operate in wetlands. The survey indicates that sectors such as Remera, Gisozi, Kacyiru, Gatsata and Kinyinya have the highest number of activities. Out Of 935 marshlands of the country, 10% are located in city of Kigali.